02. This standard applies to the accounting of borrowing costs. Borrowing costs are loan interest and other costs incurred in direct relation to borrowings of an enterprise. Uncompleted assets are assets in the construction investment process and assets in the production process, which need a duration long enough (over 12 months) to be put to use according to the set purposes or to sale. (d) Financial costs of financial leasing assets. 05. For example: Uncompleted assets are those being in the construction investment process, which are either unfinished or finished but not yet put into production or use; unfinished products being in the production process of production lines with a production cycle of over 12 months. 06. Borrowing costs should be recognized into production or business costs in the period in which they are incurred, unless they are capitalized according to provisions in paragraph 07. 07. Borrowing costs directly related to the construction investment or production of uncompleted assets shall be accounted into the value of such assets (capitalized) when the conditions prescribed in this standard are fully met. 08. Borrowing costs directly related to the construction investment or production of uncompleted assets shall be accounted into the value of such assets. Borrowing costs shall be capitalized when it is highly probable that enterprises can get future economic benefits from the use of such assets and the costs can be reliably determined. 09. In cases where a particular borrowing is used only for the purpose of construction investment or production of an uncompleted asset, the borrowing cost fully eligible for capitalization for such uncompleted asset shall be determined as borrowing cost actually arising from borrowings minus (-) incomes earned from temporary investments of such borrowings. 10. Incomes from temporary investments of particular borrowings shall, pending the use thereof for the purpose of obtaining uncompleted assets, be offset against borrowing costs incurred upon the capitalization. 11. In case of joint capital borrowings, which are used for the purpose of investment in construction or production of an uncompleted asset, the borrowing costs eligible for capitalization in each accounting period shall be determined according to the capitalization rate for weighted average accumulated costs incurred to the investment in construction or production of such asset. The capitalization rate shall be calculated according to the weighted average interest rate applicable to the enterprise's borrowings unrepaid in the period, except for particular borrowings for purpose of obtaining an uncompleted asset. The amount of borrowing costs capitalized during a period must not exceed the amount of borrowing costs arising during that period. 12. If any discount or premium arises upon the issuance of bonds, the borrowing interest shall be readjusted by amortizing the value of such discount or premium and readjusting capitalization rate in an appropriate manner. The amortization of the discount or premium may be effected by the actual interest rate method or straight line method. Borrowing interests and amortized discounts or premiums capitalized in each period must not exceed the actual borrowing interest amount and amortized discount or premium amount in that period. (c) Activities that are necessary to prepare the uncompleted asset for its intended use or sale are being conducted. 14. Costs of the investment in construction or production of an uncompleted asset include costs which must be paid in cash, transfer of other assets or the acceptance of interest-bearing liabilities, excluding subsidies or supports related to the asset. 15. Activities necessary to prepare the asset for its intended use or sale include the activities of construction, production, technical and general management prior to the commencement of construction or production, such as the activities related to the application for permits prior to the commencement of construction or production. However, such activities do not cover the holding of an asset when no construction or production that changes the asset's state is taking place. For example, borrowing costs related to the purchase of a land plot requiring site preparation activities shall be capitalized in the period during which activities of preparing such site are conducted. However, borrowing costs incurred while such land plot is purchased for the purpose of holding without construction activities related to such land plot, shall not be capitalized. 16. The capitalization of borrowing costs shall be temporarily ceased in periods during which the investment in construction or production of uncompleted assets is interrupted, except for cases where such interruption is necessary. 17. The capitalization of borrowing costs shall be temporarily suspended when the investment in construction or production of uncompleted assets is abnormally interrupted. At that time, incurred borrowing costs shall be recognized as in-period production or business costs until the investment in construction or production of uncompleted assets resume. 18. The capitalization of borrowing costs shall terminate when the major activities necessary to prepare the uncompleted asset for its intended use or sale are completed. Borrowing costs arising afterward shall be recognized as in-period production or business costs. 19. An asset is ready for its intended use or sale when its construction or production is complete even though general management works might still continue. In cases where due to minor changes (such as the asset decoration at the purchaser's or user's request) these activities are not yet completed, the major activities are still considered complete. 20. When the investment in construction of an uncompleted asset is completed in parts and each completed part is capable of being used while the construction investment continues for the other parts, the capitalization of borrowing costs shall terminate when all major activities necessary to prepare that part for its intended use or sale are completed. 21. For a trade quarter comprising many buildings, each of which can be used separately, the capitalization shall terminate for borrowed capital used for each particular completed work. However, for the construction of an industrial plant involving many production items which are carried out in sequence, the capitalization shall terminate only when all production items are completed. (c) Capitalization rate used for determining borrowing costs capitalized in the period. 01. This standard aims to prescribe and guide the principles and methods for compiling and presenting cash flow statements. 02. This standard applies to the compilation and presentation of cash flow statements. The cash flow statement is used in assessing and forecasting the possibilities in terms of amount, timing and certainty of future cash flows; it is also used in re-checking the previous assessments and forecasts of cash flows, and examining the relationship between profitability and net cash flow as well as impacts of price fluctuation. Cash comprises cash in funds, cash on transfer and demand deposits. Cash equivalents are short-term (not exceeding 3 months) investments, which can be easily converted into known amounts of cash and are subject to an insignificant risk of conversion into cash. Cash flows are inflows and outflows of cash and cash equivalents, excluding internal transfers between cash and cash equivalent amounts within enterprises. Business activities are principal revenue-earning activities of enterprises and activities other than investment or financial ones. Investment activities are activities of procuring, constructing, liquidating, assigning or selling long-term assets and other investments other than cash equivalents. Financial activities are activities that result in changes in size and structure of the owners' equity and borrowed capital of enterprises. 05. Enterprises shall have to present in-period cash flows in their cash flow statements upon three types of activities: business, investment and financial activities. 06. Enterprises may present their cash flows from business, investment and financial activities in a manner which is most appropriate to their business characteristics. The classification of and reporting on cash flows by activities shall provide information which help users assess impacts of those activities on the enterprises' financial positions and on cash and cash equivalent amounts generated by the enterprises in the period. This information may also be used to evaluate the relationships among the above-said activities. 07. A single transaction may involve cash flows in different types of activities. For example, the repayment of a borrowing including both the principal and interest, in which the interest belongs to business activities and the principal belongs to financial activities. (j) Cash payments of fines or compensations imposed on enterprises for their breaches of economic contracts. 09. Cash flows relating to the purchase and sale of securities for commercial purposes shall be classified as cash flows from business activities. (g) Cash receipts from loan interests, dividends and earned profits. (f) Cash payments of dividends or profits to owners or shareholders. 12. For banks, credit institutions, financial institutions and insurance enterprises, their arising cash flows bear distinct characteristics. When making their cash flow statements, these organizations shall have to base themselves on their operation natures and characteristics to classify cash flows in an appropriate manner. (p) Other payments for business activities. 14. For insurance enterprises, received insurance premiums and paid insurance indemnities as well as receipts and payments related to clauses of insurance policies shall all be classified as cash flows from business activities. 15. For banks, credit institutions, financial institutions and insurance enterprises, cash flows from investment activities and financial activities shall be similar to those of other enterprises, except for loans provided by banks, credit institutions and financial institutions, which are already classified as cash flows from business activities for the reason that they relate to principal revenue-generating activities of enterprises. - Direct analysis and synthesis of cash receipts and payments upon each receipt or payment item according to the accounting records of enterprises. + Cash flows relating to investment and financial activities. - Profits or losses from investment activities. 17. Enterprises shall have to report separately cash inflows and cash outflows from investment and financial activities, except for those cash flows which are reported on a net basis and mentioned in paragraphs 18 and 19 of this standard. - Acceptance and repayment of demand deposits by banks, amounts transferred or paid via banks. - Other borrowings and loans of a short-term of 3 months or less. (c) Provision of loans to customers and repayment of those loans by customers. 20. Cash flows arising from foreign-currency transactions must be converted into the accounting currency at the foreign exchange rates at the time such transactions arise. Currencies in cash flow statements of institutions operating overseas must be converted into the accounting currency of the parent companies at the actual exchange rate of the cash flow statement date. 21. Unrealized exchange rate difference arising from the changes in exchange rates for converting foreign currencies into the accounting currency are not cash flows. However, the exchange rate difference due to the conversion of cash and cash equivalents currently deposited in foreign currencies must be separately presented on cash flow statements in order to compare cash and cash equivalents at the beginning and the end of the reporting period. 22. For enterprises (other than banks, credit institutions and financial institutions), cash flows relating to already paid loan interests shall be classified as cash flows from business activities. Cash flows relating to received loan interests, dividends and profits shall be classified as cash flows from investment activities. Cash flows relating to already paid dividends and profits shall be classified as cash flows from financial activities. These cash flows must be presented as separate norms suitable to each type of activities on cash flow statements. 23. For banks, credit institutions and financial institutions, the already paid or received interests shall be classified as cash flows from business activities, other than received interests definitely identified to be cash flows from investment activities. The received dividends and profits shall be classified as cash flows from investment activities. The paid dividends and profits shall be classified as cash flows from financial activities. 24. The total amount of loan interest paid in the period must be presented in the cash flow statement whether it has been recognized as a cost in the period or capitalized in accordance with accounting standard No. 16 "Borrowing costs." 25. Cash flows relating to enterprise income tax shall be classified as cash flows from business activities (except for cases where they are determined as cash flows from investment activities) and presented as separate norms on cash flow statements. 26. Cash flows arising from the acquisition and liquidation of subsidiary companies or other business units shall be classified as cash flows from investment activities and presented as separate norms on cash flow statements. 27. The total amount of payments for and/or receipts from the acquisition and liquidation of subsidiary companies or other business units shall be presented in cash flow statements in net cash and cash equivalents paid for or received from the acquisition and liquidation. (d) Value portion of assets and liabilities other than cash and cash equivalents at subsidiary companies or other business units acquitisioned or liquidated in the period. Value of such assets must be synthesized upon each type of asset. 29. Investment and financial transactions that do not require the direct use of cash or cash equivalents shall not be presented in cash flow statements. (c) The conversion of debts into owners' equity. 31. 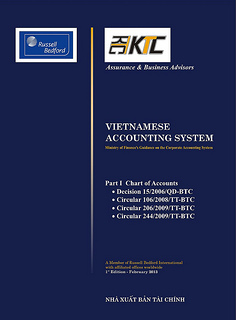 Enterprises shall have to present in their cash flow statements the norms of cash and cash equivalents at the beginning and the end of the period, effects of changes in foreign exchange rates for converting the currently held cash and cash equivalents in foreign currencies for comparison of the data in cash flow statements with the corresponding items on the balance sheets. 32. Enterprises shall have to present the value of and reasons for large cash and cash equivalent amounts that they have held and not been used due to limitations prescribed by law or other commitments which must be fulfilled by enterprises. 33. There are many circumstances in which cash and cash equivalent balances held by enterprises are not available for use for business activities. For example: Cash amounts accepted as deposits or into escrow accounts; special-use funds; project funding, etc.